New Delhi/Ahmedabad: Honda Motorcycle and Scooter India (Pvt.) 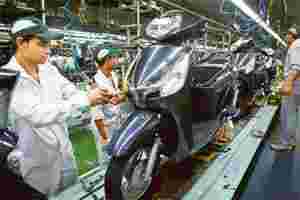 Ltd (HMSI) plans to set up at least two more plants in the country in pursuit of its ambition to become India’s largest selling two-wheeler company in the next 10 years, according to three people familiar with the development. The company is already in exploratory talks with the Gujarat and Uttarakhand governments for setting up the plants over the next three-four years. The proposed plants will add another 2.5 million units to HMSI’s capacity. The Indian two-wheeler industry will grow at an average annual growth rate of 14%, according to the Society of Indian Automobile Manufacturers. At this rate, the market is expected to double every four years till 2020. The industry sold 11.8 million units in 2010, registering a growth of 26% over the previous year. HMSI’s market share in the first seven months of this fiscal to October stands at 13.4%. It trails Hero MotoCorp Ltd, which dominates the two-wheeler market with a 45% share, and Bajaj Auto Ltd, which has a 20% share. While Hero MotoCorp has a total capacity of 6.4 million units, Bajaj has a capacity to produce 5.5 million units a year. Japan’s Honda Motor Co. Ltd exited its joint venture with the Hero Group—Hero Honda Motors Ltd—in December 2010 and is now focused on HMSI, its two-wheeler subsidiary, for its plans in the Indian two-wheeler market. HMSI already has two plants in Gurgaon (Haryana) and Tapukara (Rajasthan) with a capacity of 2.8 million units. It is already building a third factory in Narsapuram in Karnataka, which will add another 1.2 million to its capacity in 2013. HMSI executives have visited Gujarat a couple of times in the past three months and held preliminary-level talks with government officials for setting up a new plant in the state. The company is looking for250 acres of land for its new factory, said a government official on condition of anonymity. “Honda officials told us that they have been asked by the top management to survey potential sites in the country for setting up a new project. Gujarat has emerged as a new auto destination with companies like Ford and Peugeot deciding to set up their new plants here, and Honda was keen to know about the incentives offered to these auto companies," he said. While Honda has not submitted a detailed proposal, the company plans an investment of Rs500 crore in the plant, according to the government official. The state government offers incentives including soft loans and some tax benefits to companies aiming to invest at least Rs1,000 crore on a project. “If Honda wants to avail these benefits, they have to invest Rs1,000 crore or more," the official said. The company is also in talks with the Uttarakhand government for another plant in the country, said the person cited above. “We have laid the foundation of a third factory at Narsapuram, Karnataka. With the three plants, we shall have a capacity to produce four million units by 2013," the company said in an emailed response. “Any further expansion is not decided and it depends upon market demand." Shinji Aoyama, a former chief executive of HMSI, had told Mint in March that the company wants to emerge as the leader in the country’s two-wheeler market. “Our target is to become the No. 1 company in the next 10 years," Aoyama had said. In line with its expansion plan, the company also plans to put in place a cost-effective supply chain for delivering products. “As our dealer sales and service network is expanding rapidly, we have created five regions for sales operations from 2007. The Bangalore, Pune and Kolkata regional offices were already set up between 2007 and 2010. However, the Lucknow office started in 2011 for the central region," the company said in the email. “This plan is to speedily build network to respond to customer requirement quickly." It’s an ambitious step taken by HMSI to take on Hero MotoCorp, said an analyst with a leading brokerage firm, who declined to be named. “They have been very aggressive in the country and with this kind of expansion plan, the intent is very clear," said the analyst. “But as far as Honda dominating the market is concerned, I have some doubts as the other three (Hero, Bajaj and TVS Motor Co. Ltd) are seasoned players in this market."